Darjeeling: Chief minister Mamata Banerjee on Thursday played the son-of-the-soil card dominating the political discourse in the Hills by telling a rally at Darjeeling’s Chowk Bazar that Trinamool-GJM (Binay Tamang faction) had fielded a ‘bhumiputra’ and didn’t fly in any candidate from Delhi or Manipur. Banerjee also made it clear that while Trinamool was contesting the Darjeeling seat with an ally to bolster the party’s strength in the Lok Sabha, she would reciprocate when her poll partners contest the state assembly polls. Banerjee said they have been clamouring on the ‘bhumiputra’ issue, “but I want to ask you who is Amar Singh Rai? Isn’t he one of your own? Or BJP and Bimal Gurung will also decide what a bhumipurta means? Their candidate has come from Delhi. I heard he is from Manipur”. She said, “We want the identity of Gorkha brothers and sisters to be safeguarded. We want a solution to the issue of Hills.” “My salute to the Gorkha regiment. They are the pride of the country. They have sacrificed their lives for the country, she added. Reminding people how BJP had failed to work or stand by them during difficult times, Banerjee highlighted her work. “The Hills people asked for a central university but the central government did not do anything. So I set up a state university and also a campus of the Presidency College in Kurseong. Some more educational hubs are also being established,” she added. Darjeeling: As the state kick-started the first phase of elections with Cooch Behar and Alipurduar going to polls on Thursday, Chief Minister Mamata Banerjee addressed a huge rally in Darjeeling and launched a scathing attack on the BJP for not doing any development in the Hills. Darjeeling goes to polls in the second phase of elections on April 18. "The BJP wants unrest in the Hills. They light the fire here and Delhi adds fuel. They do not want development and peace here. People in Delhi (BJP) instigate the problems here. The more the problems, the better are their chances of taking advantage of the situation. The BJP does not want any progress in Darjeeling, Kalimpong, Kurseong and Mirik areas. You had elected BJP, now is the time to ask them what have they done in the Hills in the past 10 years. 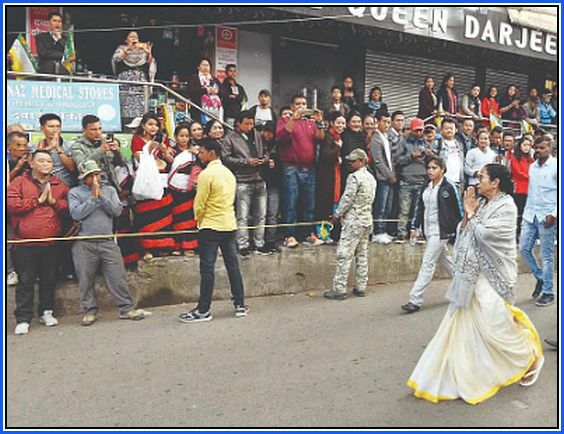 What have they done for Darjeeling," questioned the TMC supremo to which the crowd replied in unison "Nothing." Banerjee, flanked by the Gorkha Janmukti Morcha (GJM) leaders, addressed a mammoth rally at the Darjeeling Motor Stand on Thursday. Both TMC and GJM supporters from Darjeeling and Kalimpong had gathered. "The saffron party's outgoing MP S S Ahluwalia never visited the region after winning the election. The parliamentarian, who fled the Hills, is contesting from Burdwan this time," she claimed. "Now, they (BJP and allies) are saying that they have a Bhumiputra (son of the soil) and that people should vote for him. Then who is Amar Singh Rai? Isn't he a Bhumiputra? Whenever someone is with Bimal Gurung and BJP, he becomes a Bhumiputra and when he is with me, he ceases to be one? What sort of double standard is this? I didn't bring anyone from Delhi," stated Banerjee. Chief minister Mamata Banerjee on Thursday played the son-of-the-soil card dominating the political discourse in the Hills by telling a rally at Darjeeling’s Chowk Bazar that Trinamool-GJM (Binay Tamang faction) had fielded a ‘bhumiputra’ and didn’t fly in any candidate from Delhi or Manipur.